The Rev. James Martin, S.J., is a Jesuit priest, author and editor at large at America, the national Catholic magazine. His most recent books are Seven Last Words, The Abbey, and Jesus: A Pilgrimage which is a New York Times best-seller. Among his other books, The Jesuit Guide to (Almost) Everything: A Spirituality for Real Life, a New York Times bestseller, was awarded a 2010 Christopher Award, and was also a number one bestseller in Catholic books. His memoir My Life with the Saints, which received a 2007 Christopher Award, was named one of the Best Books of 2006 by Publishers Weekly, and also received a First Place award from the Catholic Press Association. His book A Jesuit Off-Broadway: Center Stage with Jesus, Judas and Life’s Big Questions, was named one of Publishers Weekly’s Best Books of 2007 and was awarded a First Place award from the Catholic Press Association. 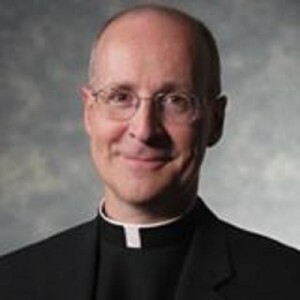 Besides articles in Catholic publications like America, Commonweal, U.S. Catholic, Catholic Digest and The (London) Tablet, Father Martin has written for, among other places, The New York Times, The Wall Street Journal, The Boston Globe, The Chicago Tribune, The Philadelphia Inquirer, O Magazine and other newspapers and websites, including Slate, Time, CNN, The Huffington Post and The New York Times’s and The Washington Post’s websites. He has commented on religion and spirituality in the national and international media, and he has appeared on all the major radio and television networks, and also in venues as diverse as National Public Radio’s “Fresh Air with Terry Gross,” NPR’s “Weekend Edition,” PBS’s “Newshour,” Comedy Central’s “The Colbert Report” and Fox News Channel’s “The O’Reilly Factor,” as well as ABC, NBC, CBS, CNN, MSNBC, PBS, The History Channel, the BBC, Voice of America and Vatican Radio. He served as expert commentator for ABC News during the papal conclave of 2013.